Unscented Lotion replenishes and moisturizes dry skin. This non-greasy formula, with Vitamin B5 and skin essential moisturizers, improves skin’s moisture barrier for healthier-looking skin without added fragrance. Clinically shown to moisturize for 24 hours. 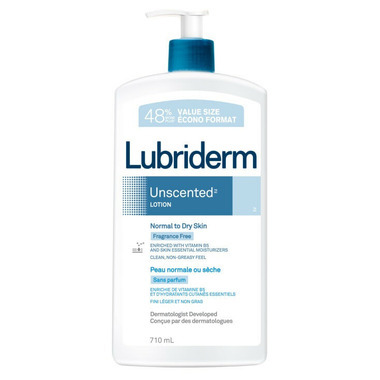 Dermatologist developed Lubriderm is specially formulated with skin essential moisturizers naturally found in healthy skin. Dosage: Smooth on hands and body every day. Ingredients: Water (eau), Mineral Oil (huile minérale), Glycerin, Caprylic/Capric Triglyceride, Stearic Acid, Cetyl Alcohol, Phenoxyethanol, Cetearyl Alcohol, Dimethicone, Carbomer, Ceteareth-20, Sodium Hydroxide, Sodium Citrate, Methylparaben, Propylparaben, Citric Acid, Ethylparaben, Panthenol.